On July 9, 2013, the trial of Le Quoc Quan, one of Vietnam’s most active human rights defenders and an outspoken blogger, was supposed to take place in Hanoi. But Vietnamese authorities at the last minute decided to postpone his trial until further notice. This is the latest in a string of fair trial violations that have been committed towards the activist since his arrest last year. Quan exposed human rights abuses commonly ignored by Vietnamese state media on his blog. Prior to being disbarred from practising law in 2007, he defended human rights cases in court. Because of his work, Quan has been repeatedly harassed by State authorities. He was detained for 100 days in 2007, kept under State surveillance and attacked by men near his home in August 2012, when he was beaten with a steel baton. His family members have been targeted with legal action as well. 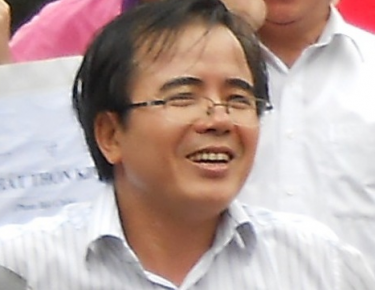 Quan was arrested on 27 December 2012 and charged with “tax evasion”, a fabricated charge sometimes used by the Vietnamese government to clamp down on those who oppose them. After his arrest, now more than five months ago, Quan has largely been held incommunicado. He has been denied access to his family and was allowed to see his lawyer only once, briefly, during a police interrogation. During the first 15 days of his detention, Quan was on hunger strike. Quan’s detention was extended without the notification required under Vietnamese law when the initial four-month period allowed for investigation had concluded. While Quan has been allowed the occasional visit from his lawyer since last month, he is still denied visits from family members. The prosecution of Quan fits into a wider pattern of oppression of free speech in Vietnam. The World Press Freedom Index 2013 ranks Vietnam among the ten worst countries when it comes to respect for press freedom: At least 31 citizen journalists and 2 journalists working for traditional media organizations are currently jailed in the country. Among those imprisoned are bloggers Nguyen Van Hai (popularly known by his pen name “Dieu Cay”), Tạ Phong Tan and Phan Thanh Hai, whose appeal against their conviction for “conducting propaganda against the Socialist Republic of Vietnam” was rejected in December last year. Eight of the fourteen young bloggers convicted in January for “carrying out activities aimed at overthrowing the people’s administration” appealed their sentences – their convictions were upheld on 23 May, though Paulus Le Son’s sentence was reduced from 13 to four years in prison. If Quan’s eventual trial follows the pattern of prosecutions brought against these bloggers and other dissenting voices over the past few years, will last for no more than a day. The court will need very little time to come to its “decision”, on which it is likely to have received instructions beforehand. No independent trial observers will be allowed in the court room and those wanting to show support outside the court house will be kept at a safe distance by the police. Family members and human rights activists will be arrested before they can come near the location of the trial. Keeping a spotlight on cases such as Quan’s is crucial. In March this year, the Media Legal Defence Initiative led a coalition of human rights NGOs in an appeal to various UN watchdogs to secure the release of Le Quoc Quan. Similar action has been taken by Stanford Law School’s Allan Weiner on behalf of the fourteen bloggers. Formal action is still pending, but in the meantime it is important that a watchful eye is kept on developments on these legal processes as they unfold. Along with civil society, Vietnam's donors should continue holding the government to account for these prosecutions, which are in flagrant violation of Vietnam's obligations under international human rights law. Nani Jansen is Senior Legal Counsel at the Media Legal Defence Initiative (MLDI).